Kee Facts: The Strangely True Tale Of Johnny Appleseed He's legend now, but the man was as odd as his myth. Long-haired, barefoot and nature-loving, John Chapman traveled the Midwest in the early 1800s planting trees and creating orchards for future settlers. Apples — right off the tree, baked in a pie, pressed into cider or mashed into sauce — are a basic element of American culture. October is the month to celebrate them, thanks, in part, to Johnny Appleseed. You've probably heard of the legendary character who traveled the Midwest planting trees, but he's not a myth. Johnny Appleseed's real name was John Chapman, and he was born in Massachusetts in either 1774 or 1775. He was first noticed by history in 1801 when he arrived on horseback at the farm of John Stedden in Licking Creek, Ohio. Stedden thought Chapman was rather eccentric, but he listened to the man's plans to head west and plant apple seeds along the way for future settlers. 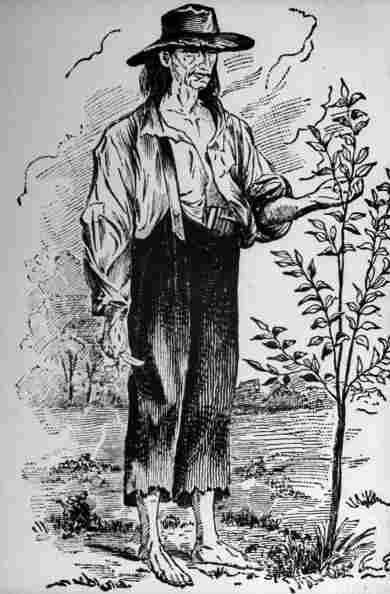 Five years later, another Ohio settler encountered Johnny Appleseed. Chapman had lashed two canoes together, filled one with apple seeds and was paddling along the Ohio River. He was barefoot, dressed in rags, and wore a tin pot on his head as a hat. Chapman was doing what he had told Stedden he would, traversing the country, pushing farther west each year. Wherever he found a suitable spot, he planted apple seeds and educated farmers about nurseries and orchards. Chapman was a vegetarian and, by all accounts, a caring and compassionate — if somewhat odd — man. For more than 40 years, he traipsed the fields and forests from Pennsylvania to Illinois, spreading the word about apples until his death in 1845. A memorial grave site in Fort Wayne, Ind., has a stone marker bearing the motto, "He lived for others."